Knowing what to do in the event of a fire is particularly important for older adults. At age 65, people are twice as likely to be killed or injured by fires compared to the population at large. And with our numbers growing every year - in the United States and Canada, adults age 65 and older make up about 12 percent of the population - it's essential to take the necessary steps to stay safe. 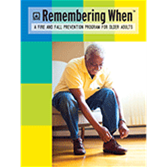 Remembering When: A Fire and Fall Prevention Program for Older Adults, was developed by NFPA and the Centers for Disease Control and Prevention (CDC) to help older adults live safely at home for as long as possible. The program is built around 16 key safety messages – eight fire prevention and eight fall prevention. If you don't live in an apartment building, consider sleeping in a room on the ground floor in order to make emergency escape easier. Make sure that smoke alarms are installed in every sleeping room and outside any sleeping areas. Have a telephone installed where you sleep in case of emergency. When looking for an apartment or high-rise home, look for one with an automatic sprinkler system. Sprinklers can extinguish a home fire in less time that it takes for the fire department to arrive. The majority of fatal fires occur when people are sleeping, and because smoke can put you into a deeper sleep rather than waking you, it´s important to have a mechanical early warning of a fire to ensure that you wake up. If anyone in your household is deaf or if your own hearing is diminished, consider installing a smoke alarm that uses a flashing light or vibration to alert you to a fire emergency. View a list of product manufacturers. Conduct your own, or participate in, regular fire drills to make sure you know what to do in the event of a home fire. If you or someone you live with cannot escape alone, designate a member of the household to assist, and decide on backups in case the designee isn't home. Fire drills are also a good opportunity to make sure that everyone is able to hear and respond to smoke alarms. Make sure that you are able to open all doors and windows in your home. Locks and pins should open easily from inside. (Some apartment and high-rise buildings have windows designed not to open.) If you have security bars on doors or windows, they should have emergency release devices inside so that they can be opened easily. These devices won't compromise your safety, but they will enable you to open the window from inside in the event of a fire. Check to be sure that windows haven't been sealed shut with paint or nailed shut; if they have, arrange for someone to break the seals all around your home or remove the nails. Keep a telephone nearby, along with emergency phone numbers so that you can communicate with emergency personnel if you're trapped in your room by fire or smoke. Request a high-quality color printout of NFPA's updated Remembering When™ program. Older adults face elevated risks for fire and fall hazards. 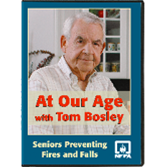 Teach seniors practical tips for staying safe with the At Our Age with Tom Bosley Video. Order now.